June and Heather have spent the past several days discussing the fact that Heather loves June’s new baby and wants to have a baby but is married to a man vanishing into Alzheimer’s and thus will never have a baby and is very sad about it. But remember, Heather isn’t just a sad Scottish ex-nanny with a senile husband; she’s also a criminal conspirator who has masterminded schemes of corporate skullduggery not once but twice. She is going to feel zero moral qualms about kidnapping that baby the moment June leaves the room, is what I’m saying. 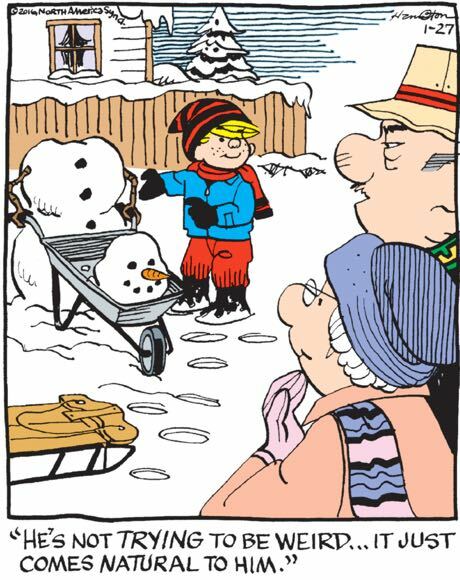 See, you thought the joke of this cartoon was going to be that these little kids unthinkingly reminded the old man that he would be dead soon, but in fact the joke is that they’ve reminded him of the many terrible, terrible things he’s seen and done. It’s nice when a long-standing feature like Hi and Lois can keep you guessing!